Many times it is seen that all planets are in the best position or in friend house in our horoscope but we do not get much success. Then we will have to know if any planet is not inhibiting our success. If our horoscope planets do not helping us then we should understand that they are not working. That's mean any planet is inhibiting factor in our success. Due to inhibiting factor planet all other good planets are not helping us. When we will know this then we should worship those planets or get it done by any priest. So that all our work can complete and we get peace. Please donate something for those inhibiting factor planets. We are mentioning here inhibiting factor planet for all Lagna horoscope, so that you can get peace by doing their worship accordingly. 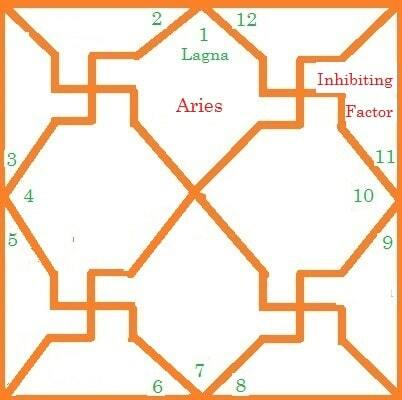 1: If first house(Lagna) in horoscope is of Aries then the owner of eleventh house is inhibiting factor. Your horoscope planets are good but you are not getting success after doing hard work then please do worship of eleventh house owner. Here owner of eleventh house will be Saturn, so please do worship of Saturn, burn deepak on peepal tree in evening and donate black things on Saturday. Note: We have mentioned inhibiting factor planet for all Lagna horoscope with their remedies. Please take suggestion on priest and do worship of that planet. We hope you will get success in your work by doing their worship. Have a happy and long life.